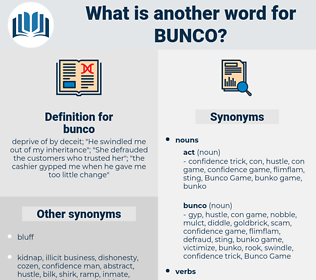 What is another word for bunco? deprive of by deceit; " He swindled me out of my inheritance"; " She defrauded the customers who trusted her"; " the cashier gypped me when he gave me too little change"
peace, openness, truthfulness, reality, honesty, truth, frankness. devotion, faithfulness, harmony, fidelity, constancy, forthrightness, loyalty, love. come clean, be honest, protect, reveal, support, tell truth. give, fail, offer, help, assist, lose, aid.